The 40-0918 Manual-Leveling Rotary Laser Level is a great opening price point laser level and a great seller for Johnson Level. 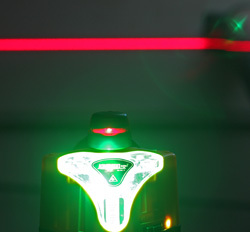 It is very simple to use and has essential features for the average use of a rotary laser level. Learning more about this manual-leveling laser level is easy - read more at the 40-0918 level product page or by reading the following review and/or watching the informative video made by Tom Hintz, included in the original review. This review can be viewed in it's original form at NewWoodworker.com. I was surprised at how easy this laser level is to use. Of course using it means you no longer have an excuse for everything not to line up right! Remember when drawing a level line across more than one wall involved tubes of colored water or a bunch of guessing? Modern electronics is making that task much easier and that translates directly into accuracy and simplicity. If you can see a thin red line you can install or hang things where they actually belong and level to a common line around the space! Shown in the accompanying photos and video comes with the rotary level unit itself, a folding tripod, 4-AA batteries (for the laser unit) a pair of red-colored glasses, the instruction manual and a fitted hard case to keep the Johnson Manual-Leveling Rotary Laser system together and protected. The rotary laser has a variable rotation of 0 to 600 rpm controlled by one ON/OFF/RPM dial on its side. 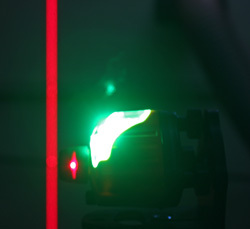 For the more intense geeks among us this is a class llla laser with a wavelength of 650nm+/-10nm. It has a maximum power output of 5mW and an accuracy of +/-1/8" at 30-ft. All that means that the Johnson Manual-Leveling Rotary Laser can handle a 200-ft-diameter area depending on the ambient lighting. The included tripod (left) is very light but stable. The hard case and everything you see here (right) comes in the kit shown in this review. Setting the Johnson Manual-Leveling Rotary Laser up for use is very straightforward. It can be used with or without the included tripod which is identical to common photographic tripods. The laser unit mounts to the tripod with a threaded lug just like a camera. The only difference is the size of that lug. TheJohnson Manual-Leveling Rotary Laser connects to the tripod with a hefty 5/8" by 11 thread that can withstand the everyday use a tool like this might experience. The mounting base for the Johnson Manual-Leveling Rotary Laserallows it to be screwed onto the tripod straight up for jobs like installing windows or hanging pictures. It can also be attached to the tripod on its back for installing studs, rafter assemblies and anything that needs to be truly vertical. The base can also be hung from a screw on a wall or vertical fixture you build for specialty jobs using a cast-in keyhole opening. The Johnson Manual-Leveling Rotary Laser unit itself has X & Y axis adjusters, one in each corner with a pair of easy to read leveling spirit vials above the two front corner adjusters along with one vertical vial on the front of the unit that is used to level it when attached on its back. Dial the laser base in so that the bubbles in both vials are centered and you are ready to shoot a level line all around the room. Just in case you are doing all this in limited light the spirit vials are illuminated. The manual also describes another way to use the laser line itself in bigger spaces to dial it in. Either way, setup is not a major issue. Aside from mounting the laser unit onto the tripod (or whatever it will be used on) all you have to do is to install the four AA batteries that are included in the kit. Accomplish those tasks and you are ready to use the Johnson Manual-Leveling Rotary Laser. This unit can work upright to cast a horizontal line (left) or on its back to make a vertical (right) line. Note that with long exposures like this the red line gets exaggerated badly. It is very thin in the real world. Using theJohnson Manual-Leveling Rotary Laser is about as easy as it gets. I set up the tripod, screwed the Johnson Manual-Leveling Rotary Laseronto it and then installed the included batteries. All that remained was to put it where I was going to use it and level the laser head using the corner height-adjusting wheels. All of that took maybe 5 minutes, including stopping for photos now and then. By far the toughest part of doing this review was trying to get a decent picture of the laser in action. The laser line is very easy for the eye to see on the walls even with the photo lights in the area. The cameras have a major problem though which means you are going to have some faith in the descriptions in this review. The Johnson Manual-Leveling Rotary Laserkit comes with a set of red glasses that makes the laser line easier to see with human eyes in bright daylight but when put on the camera lens, everything goes red and the camera refuses to see bright red in a bright red environment. I was able to get some images and video where you can see the laser line clearly but keep in mind that time-lapse imaging makes things like the red laser line appear much bigger than when viewed by eye. In the real world, in your home or shop the Johnson Manual-Leveling Rotary Laser works very well and is easy to see. The multi-position mount lets you use the Johnson Manual-Leveling Rotary Laser on the included stand in both vertical and horizontal modes. The laser head can also be hung on a simple screw on the wall or just set it on the floor for installing baseboards or to create a level line for leveling the floor itself. 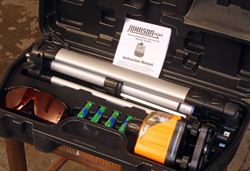 You really have all of the options necessary to use the Johnson Manual-Leveling Rotary Laser in the best manner for your situation. The ON/OFF and speed control makes setting the Johnson Manual-Leveling Rotary Laser for your needs easy. They add a printed line on the side of the laser housing that says visibility is increased by slowing the rotating laser head down. That in fact works but I also found that you can turn on the Johnson Manual-Leveling Rotary Laser light without the head spinning so you can use it in as a stationary layout tool if that works better for what you are doing. The Johnson Manual-Leveling Rotary Laser is very easy to use and comes with everything you need to get up and running right out of the box. The leveling system is easy to use which lets you get to the actual work sooner. The laser light is bright enough for daytime use as long as you don't use the high-powered photos lights we use in the shop! With a street price of around $75.00 (2-20-2011) the Johnson Manual-Leveling Rotary Laser is as good of a value as it is accurate. For this kind of money it just doesn't make sense to mess around with any other method of establishing a level line.